Though Easter 2013 has recently passed, I have just gotten around to watching one of the movies from Christmas 2012. This weekend my family watched DreamWorks’ The Rise of the Guardians. Even though it did not do terribly well at the box office, I decided to give it a try because the critics gave it positive reviews. I knew the basic storyline before popping in the DVD. Santa Claus, Sandman, the Easter Bunny, and the Tooth Fairy have to protect the world’s children from evil. Along the way they get some unlikely help from Jack Frost. This movie twists up all the traditional imagery from America’s holiday traditions. Santa Claus, referred to as “North,” features prominently, but he wields two swords (in a jolly manner) as he protects the world’s children. The movie also depicts the Easter Bunny as a boomerang wielding Australian jackrabbit. I expected a fun adventure story for the kids, but I got more than I bargained for. I did not expect that the movie would contain so many obvious allusions to Christianity. Even though the characters represent the secular side of the holidays, subtle imagery reminds the audience that those holidays are about Jesus Christ. When North explains to Jack Frost the necessity of finding his “center,” he gives Jack a Russian-nesting doll to open. Each successively smaller doll represents a different aspect of North’s personality. But when Jack gets to the center of the doll, he finds a baby wrapped in swaddling clothes. A baby wrapped in swaddling clothes is the center of Christmas. Yep. Of course neither Jack nor North mention Jesus, but the imagery is there. Similarly when the Easter Bunny despairs because the villain has ruined Easter, he cries out that Easter ultimately signifies hope and new life. Yep. Of course he doesn’t mention Jesus, but in the background hangs an Easter banner with crosses all over it. The Christian imagery is there behind and under the entire film. The Easter Bunny and North even amusingly argue over which of their holidays is the most important. This argument reflects that the church has traditionally considered Easter more important but that popular culture has replaced it with Christmas. Most striking of all, however, is the character of Jack Frost because Jack acts as a Christ figure in this film. Jack is the film’s only homeless wander, which brings to mind that “the Son of Man has nowhere to lay his head.” Jack carries a shepherd’s crook, a traditional Christian symbol pointing to the Good Shepherd. Jack also happens to be able to walk on water. Jack also demonstrates the sacrificial nature of Christ’s work. In one scene, he gives up his powers as a ransom to save someone else. This leaves him broken and trapped in a grave shaped hole; however, he rises from the hole with newfound strength. In a similar manner, Jack initially becomes Jack Frost through sacrificing himself for another. Before he was Jack Frost, he was a normal boy, but he sacrificed his own life in order to save a child from drowning. A “higher” power (the Man in the Moon) resurrects him, giving him new life and great powers. The child should have died, but Jack died in her place. After his resurrection, Jack has conquered death. His death by drowning has no hold on him, demonstrated by his ability to walk on water. I believe that most of this imagery was intended, but perhaps it was not. If it was not then this gives even more credence to J. R. R. Tolkien’s idea that Christ’s work was the True Myth. The story of Christ is the root of all reality, and the poets, even in ignorance, cannot help but refer to that reality. Allusions to Christ happen in the movies more often than you might think. 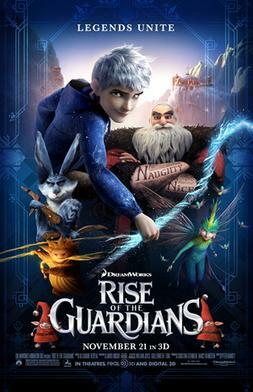 Is Rise of the Guardians a must-see movie? Probably not, but it is a pretty good choice if you want an adventure story suitable for children. The characters are fun, the story engaging, and the action is not too scary. You might even be able to use it to explore more eternal themes with your family.